Wide precoupler why only 1 year? marklin-users.net community | Forum » Collector's Corner » Collector's Corner general » Wide precoupler why only 1 year? 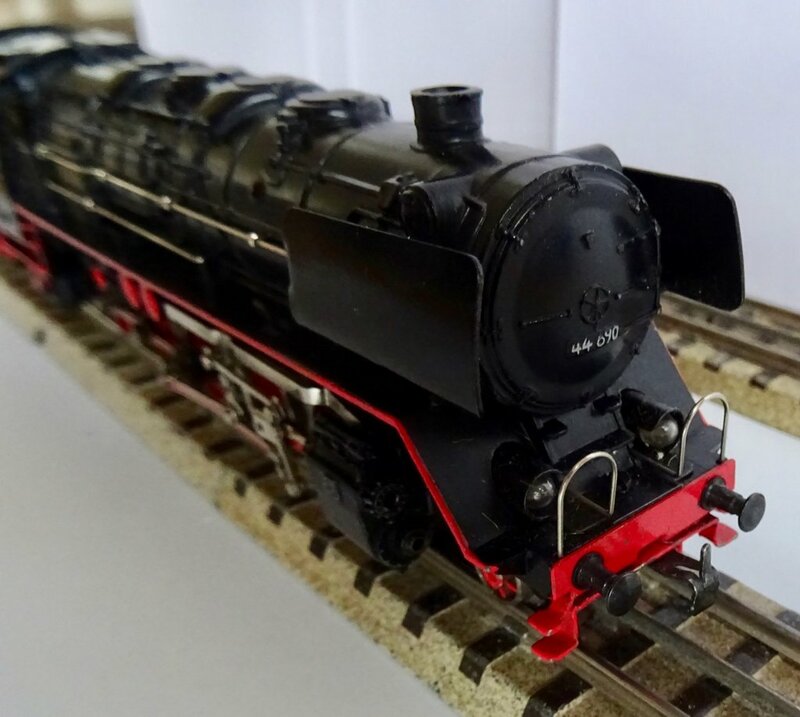 I really like the models from 1956 with the wide precoupler (breite Vorentkupplung). They have always caught my eye and are interesting to me. 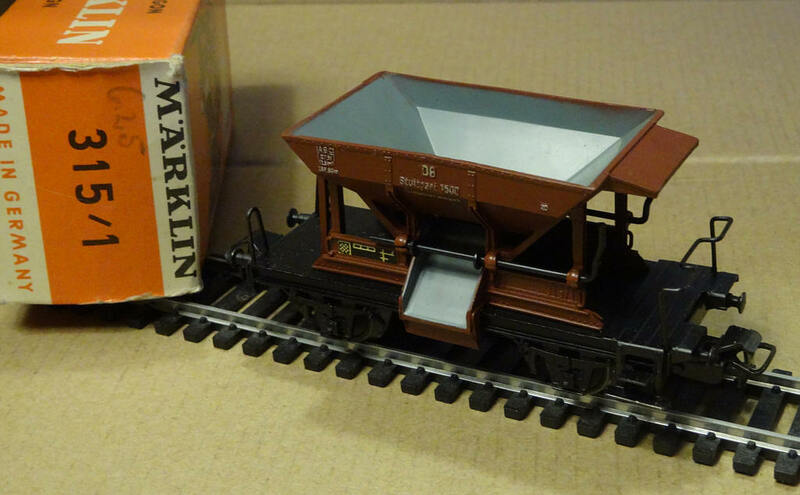 But I never understood why Märklin only produced them for one year (1956). Why was it only produced for one year? It seems to operate just fine, was it a bad design? No, I don't know it. I can just speculate that it was an patent issue. The 1956 design with the bent cover works even better than the later version. I can't imagine another reason. The newer version is not cheaper to produce or has any other advantages. Vielen Dank Markus. I really like the style & function of these couplers. Going to have to keep my eye open for Wagens with this type coupler. I have only seen them on Locomotives and freight Wagens. Have you seen them on Passenger WAgens? 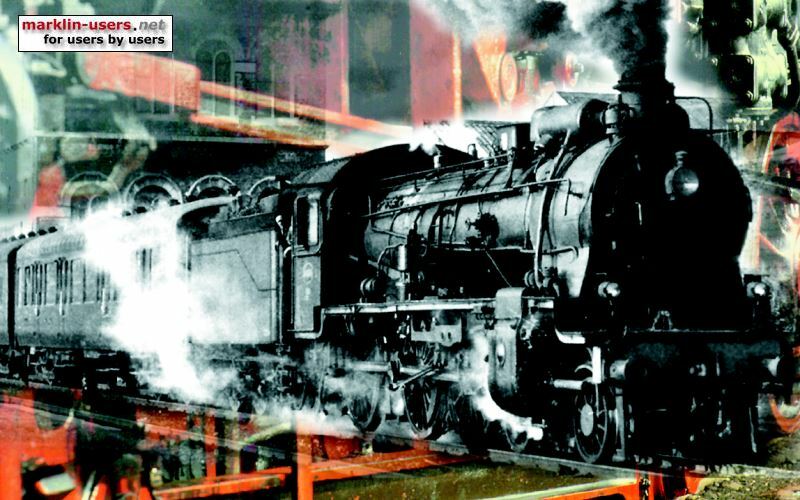 The couplers only appeared at the "better" freight wagons (310+) which where numbered 46XX from 1957 and on some locomotives. Not on passenger cars. ausgezeichnet Markus! Thank you for the information and helping my understand which models this coupler was used on. Mostly for my reference, maybe someone else's as well, I am going to list the models I have found with the wide pre coupler. If there is something I should add to the list ß please do or let me know. vielen dank Markus, thank you very much for the help. Maybe someday I can find all these items. 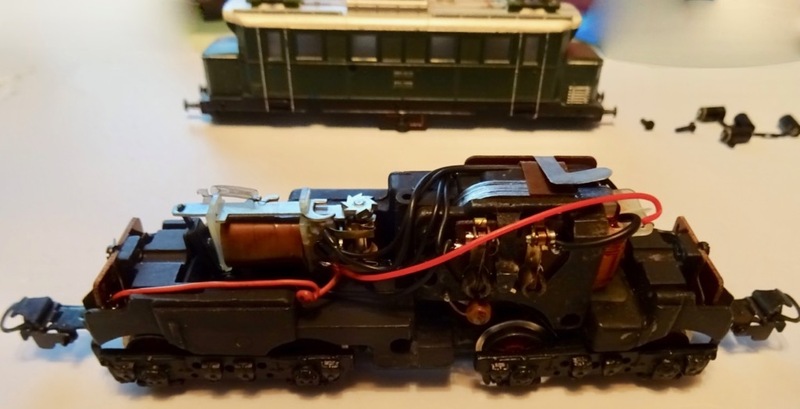 There will be those here that are wondering what the referred wide coupler looks like - how about fleshing this thread out with some comparison photos of same models listed above with each coupler for reference. As an aside, I keep an eye out for them also, being my birth year it's only fitting !! That is a good idea Cookee. Photos say it better than words sometimes. I'll put some together since we will be home today and tomorrow. Now I need to go on the roof and ensure the heater exhaust pipes are not frozen over. We are having -25F to -30F temps (-31 to -35 Celcius) tonight and I sure do not want any surprises during the night. Brrrr thats cold. Too cold for me. I have an F800 with the coupler on the tender the same as you have described. It is wide and has a bend down on it. thank you Markus, the photos are extremely helpful to understanding this thread. I should have started with some initially. Here are the first two pages from my 2001 Koll's katalog showing the different types of couplers (Kupplung). The type I am refering to is typ 6. In the photo below it is shown in the top right corner surrounded bz a zellow box and labeled Breite (wide) Vorentkupplung Typ 6 brüniert 1956.
here is a close up pick of this style coupler. Märklin had only made this coupler for one year according to the information I see in Koll's Katalog. In my opinion it is one of the best couplers. It has been my favorite lately. Do you happen to have a photo? No but My coupling is exactly like you see in the above photos. I have a crane 315/2 ~ 4611 with that coupling I just realised. Sadly it's in a very sorry state. Looking closely at the 1956 new-numbering catalogue it seems almost all the 46xx wagons had this coupling. It's same in the normal colour one, I just don't have a clear scan at hand. It is interesting that the three new 46XX-series wagons (4602, 4614 and 4616) for 1957 are shown with the wide coupler in the new-items catalogue but without that coupler in the 1957-D-catalogue. I have never seen examples with wide couplers of these wagons in reality. A bit intrigued by this discussion I took a good look at these couplers yesterday, trying to figure out the "why" Märklin changed from the wide to the narrow version. I believe the change occured for cost purposes and maybe also for robustness. First of all, the narrow version requires less material. Of course you'll say that the difference is marginal , and I agree! Not having seen the dies that cut and bend the little metal plate, I can't really say "how much" material was saved , but I'm sure it's substantial . Having observed Märklin stamping and bending process I would say that the narrow version spares about 50% material. Which also makes the part smaller in **volume** and surface . That in turn has an impact on the subsequent operation: the chemical treatment that preps and finishes the part to its "blackened" (bruniert) look. For that operation hundreds or even thousands of parts are put in a tray which goes then in the various chemical baths to be processed. All you have to do to understand my suspicion about "robustness", you will see that the coupling loop is attached to the stem by more material in the narrow version, as the cut to take on the narrow "vorentkuppler" is simply smaller. I think I have (maybe) anecdotal evidence to support this claim: in my days of running a Märklin Service station I replaced hundreds of coupler on "well played" vehicles...and a majority of those had been broken *exactly* at that level. I took a close look at my 315/2 Crane Wagon and am intrigued by the wave shape of the coupler? It's perfectly formed exactly the same on both ends so I believe this is how they are made (rather than bent later), but why shaped like this?. Are others like this?, it's not really noticeable unless you are looking side-on. Thanks for your input on his thread. Cookee, after your photo and post I took a good look at some of my wagons with this type Kupplung (coupler). It looks like there are to small tabs that are folded over to hold the wide precoupler in place. These tabs sit lower tan the other parts of the assembly and look lie the seat right in the bottom of the 1/2 loop. I tried to show it on a picture here. one negative aspect about this coupler I found is that when they do bend in this curved area it is difficult the get them back to there original shape. When I have bent them back the metal is weaker and sometimes just breaks. This is what I experienced on a 3011 E-Lok I have with these couplers. On a positive note I did find a 4612 Auto Transport with these couplers on eBay for $23 US. Sorry Cookee, but couplers were never manufactured that way! Depending on the vehicle they are attached to, you will often have a bend part, but only on the stem, never on the area around the coupling loop. I don't want to split hairs, but I just think the one in your picture has been "well played with", and that's great! I knew I could count on you for some wise-cracks. Wheels/axles however are much simpler to manufacture, and there are several diameters and axle types. 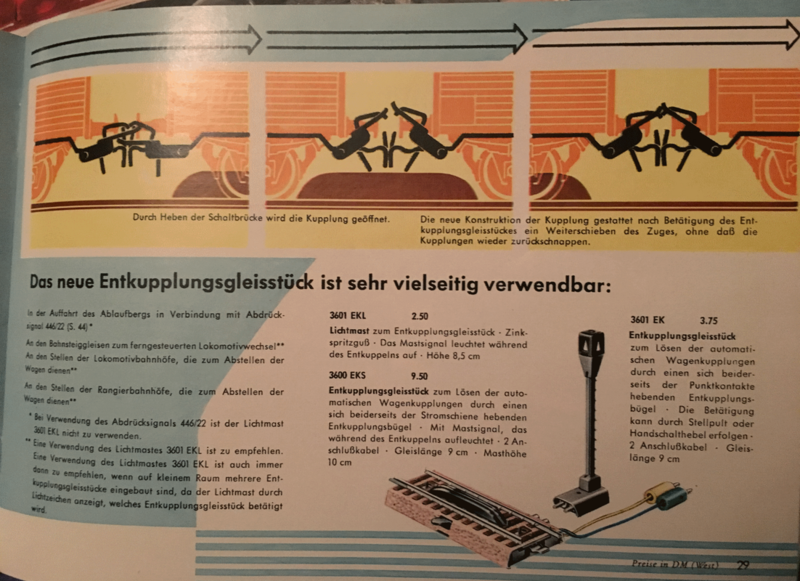 I think probably, during a short period (of 1956) Märklin produced these couplings with "waves"
I agree though that the vast majority of wide precoupler are straight. The only one I have on a SET800 is straight (unlike the picture above). No offence to anyone for respected feedback but as I said, the 'waves' in these two couplings are identical, and perfectly formed. I've dealt with enough precision parts over the years from my Cash-Register, Typewriter and Printer days to recognise something that is 'bent' vs. something original. I still hold to the view that these couplings I referred to left the factory like that and someone will surely find other examples to add. If not, I'll need some Ketchup for my Homburg!! Well, I must admit Cookee is right and I was wrong! I just looked at all the cars I have from that era, and they indeed all have the "wave" couplers! After so many years (...close to 7 decades!) of dealing with Märklin trains , this is proof that you never know it all! To my defense, I never got these type of couplers as spares, because in my days of Märklin servicing only the straight ones were available. recently I found two locomotives with the wide precoupler. collecting diecast and tinplate - what else? 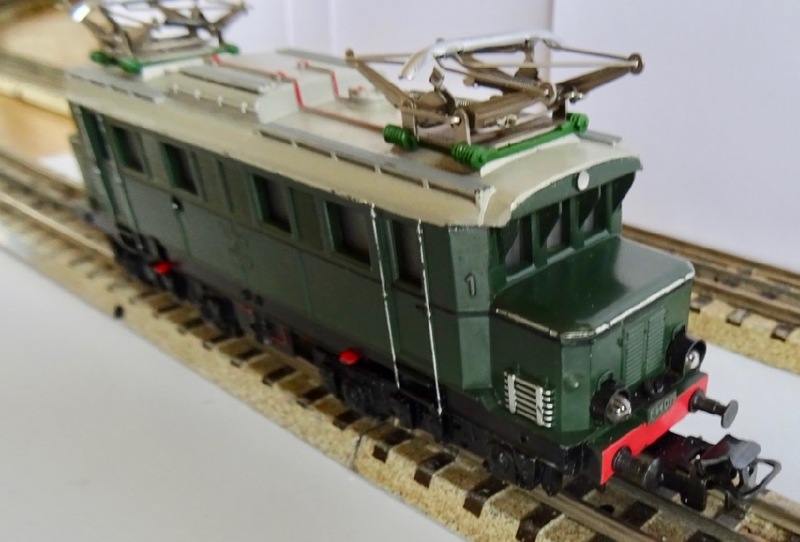 I just found another Lokomotive to add to the list. F800(3008) version 5 in Koll's Katalog has the breite Vorentkupplung.